Well first of all let me take this opportunity to wish you not only a happy New Year, but to extend that to a wonderful and blessed 2013 in general. With the mild spell continuing, I decided to switch from pursuing pike to catching carp. Well, that was the idea anyway, and as I embarked on my first outing I was most definitely a man with a plan. Targeting a shallow lake I have fished before a couple of times in the summer, I’ve only done one winter session on there – and blanked. But I put a lot of thought into this visit and headed for the section of bank which is overgrown. Well that’s an understatement really. Welcome to jungle fishing Shropshire style! There aren’t any pegs as such in the bit I fished, it was just a case of finding a gap where I could get the rods out knowing that once hooked I could get the fish in. It’s no good tackling a spot where the carp will immediately snag-up. There’s no point but above all it’s not right for the fish. Although I needed to be on the rods and hit any runs straight away, there were no welfare issues. The spot I chose though wasn’t for the angler who likes to have a bit of a social in the next peg for sure. As you hear me say on the accompanying video, I was really confident. Although the water temperature was just 5.8C, that was a reading in the shade of the trees. I expected the water at 2-3 lengths out, where I was fishing, to be a little higher, certainly 6.2C or slightly more. I show my baits on the video, and both SBS, I fished double corn-shaped popper boilies on one and a 14mm lobworm pop-up on the other. I’ve fished the latter before and caught, but on bottom baits. This was my first venture into pop-ups, well at least from the Premium range. As for the corn ones, they’ve been a regular part of my armoury for a couple of seasons. Mostly for bream and tench but excellent when I’ve wanted a small carp bait such as during colder spells or winter months. And it was the corn that provided the first fish – and avoided a blank. Already confident, my levels had rose considerably as I had spotted several active carp in my swim. With the lake being clear and shallow there was no mistaking the dark shadows that moved through the water. The second fish was a real screamer, a proper carp run as opposed to the opener which I hit as the hanger bobbed up and down. Confidence is a big part of angling and as I had thought my session through very carefully, bait included, I wasn’t surprised when I had the take. Confidence in itself won’t put fish on the bank, but a lack of it certainly won’t do you any good at all. There’s a definite difference between confidence and arrogance – it’s not even a fine-line job. And whilst we should always avoid the latter we need to definitely embrace the former. Feeling like I was on a roll, that was confirmed when I netted carp number three. Another common it was smaller than the previous one. I had been hoping that every fish would be bigger, but that wasn’t to be. And as you can see from the photos they weren’t monsters. But that’s the venue anyway. You can only catch what’s in there. Then I had a lull in proceedings caused by a woman who started throwing sticks in the lake for her dogs. I was well-hidden in trees so in fairness to her she may not have seen me. So I coughed just to let her know I was there but she carried on anyway. In the end I had to get verbal but she still continued. What’s wrong with these people? The quiet period thankfully didn’t last too long though, maybe an hour (but long enough I suppose when you consider the circumstances) and I was into fish number four. Like the one before it, it succumbed to the corn pop-up bait. And it was another screamer. There’s something exciting about a solid blue light and a persistent scream! I looked forward to this session very much and not only did I feel like a man with a plan, but that was confirmed even more so when I banked fish number five. And look at the successful bait as well! Definitely a day for the corn. I’ll certainly be using it in a couple of months or so when I begin my tench and bream fishing. 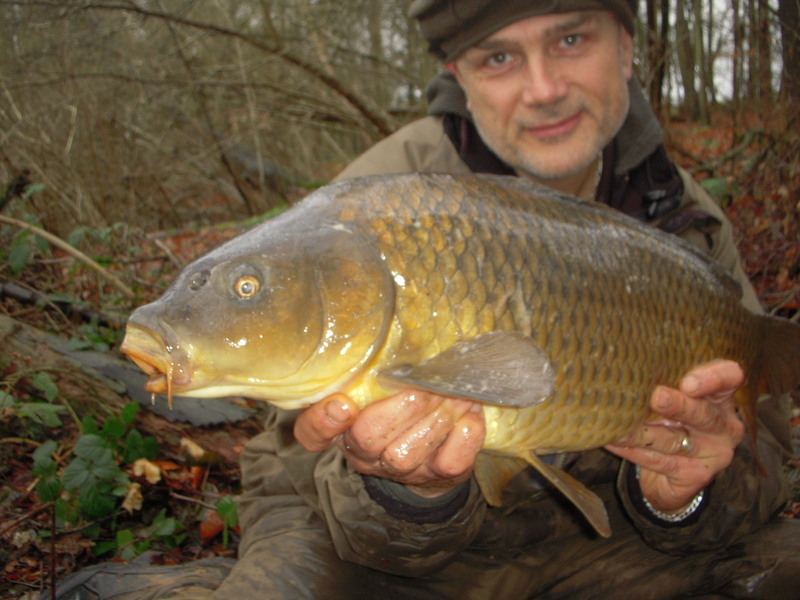 But I also find it a great winter bait for carp as I prefer smaller baits during the colder months. And don’t forget, with anglers throwing in sweetcorn in most venues on a regular basis, you can’t dismiss these for carp. In fact I showed that on this session. And I really enjoyed myself as well. It wasn’t the most comfortable of places I fished and as you can see from the video, it was a little awkward at times when it came to netting. But at no time was fish welfare even an issue and that’s what counts. Even the small fish that flips on the camera I caught. Plus I was very low on my knees on an unhooking mat. My next session saw me on a different venue. In fact, although I fish the Staffs/Worcs Canal on a regular basis including carp, this was a new spot. I hadn’t had any pointers from anyone, heard fish crashing as I walked by the swim in the past or anything like that. I just fancied giving it a go. We all have favourite swims, locations and stretches. And there’s nothing wrong with that of course. Many of mine have come because I did some legwork, lots of thinking and ultimately cast out and waited. Sometimes I did a lot of waiting! Other times it came together. There’s only one way to find out. And also, when you do hit on a good spot you’re under no obligation to share with the world via the internet or whatever. My intention was to cast out (same baits as before), settle back and wait. However I very soon found myself re-casting as two out-of-control dogs knocked my pod over. And I wasn’t in the way as I was on a wide grassy spot. I don’t know what the answer is with people who have zero respect for others, other than confrontation. After all I’ve got about £700’s worth of stuff out there by the water’s edge. And I’m not going to let it get smashed because someone has an ‘I’ll do what I want’ attitude. I don’t seek conflict but you can’t just sit there while your gear’s getting damaged. Can you? And by the way I don’t blame the dogs! And I’m not ranting by the way, just saying. I didn’t catch on the canal, in fact not even a liner or a pluck from small roach. I’d been communicating, via twitter, with Ben Hervey-Murray from the Angler’s Mail while I was out (he was zander fishing) and talking about pioneering. I said we can either read the stories or make the headlines. To round the entry off I headed back into the county of Shropshire, but to a different venue that I opened with. Compared to the canal session at least I know they’re in there, albeit with a reputation for being elusive. Very elusive. And that’s just in the summer never mind the winter. But you have to be in it to stand a chance of winning. I stayed with the same bait approach and although I had to wait until late afternoon, a solid blue light saw me lifting into a screamer. The result wasn’t the overgrown goldfish I was after, instead it was a tench that I drew over the net. At least I had avoided a blank. Although I always target a designated species, there is no such thing as a nuisance fish in my vocabulary; they’re all welcome. I wasn’t surprised I caught the fish, as once the wind and rain eased, I could see lots of tench feeding bubbles. Plus they were around the corn popper baited area. And we all know how much tench love their corn don’t we!